Mrs. James H. French's "Texas Genealogy"
Mrs. James H. French, wife of famed San Antonio mayor, wrote a newspaper column called "Texas Genealogy". 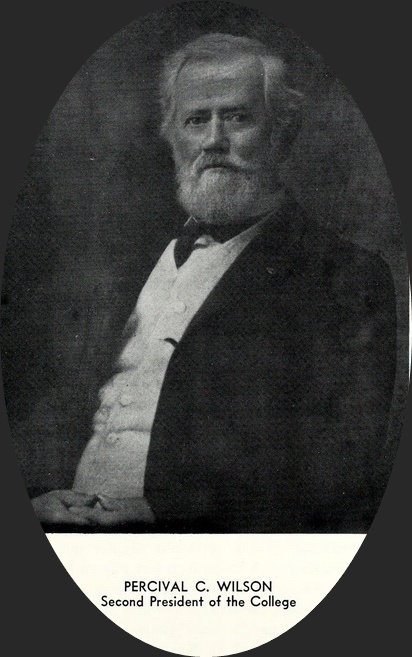 The genealogist's husband, James H. French, "the best mayor San Antonio ever had," moved to San Antonio in 1851, first working as a merchant before he was elected mayor in 1875, and he served in that position through 1885. Because of political connections within the national Democratic Party, he was thereafter appointed Postmaster for the city and was also elected city councilman before his death in 1893. His widow (the former Sarah L. Webb), began writing a genealogy column about society-minded Texans for the Sunday San Antonio Light newspaper in July 1906. In December of that year Mrs. French explained how those members of the branch from which Mary Parson Atlee sprang made their way to Texas. She had already written about the Maverick and Maury families into which Dr. Luter married almost a year earlier. Mrs. French may have been surprised that the child of a third-generation Pennsylvanian, Edwin Augustus Atlee, would find her husband in the wilds of Goliad, Texas. But that was where E.A. Atlee's third child, Anna, lived after her marriage to John Solomon McCampbell, a lawyer and later judge in Corpus Christi. 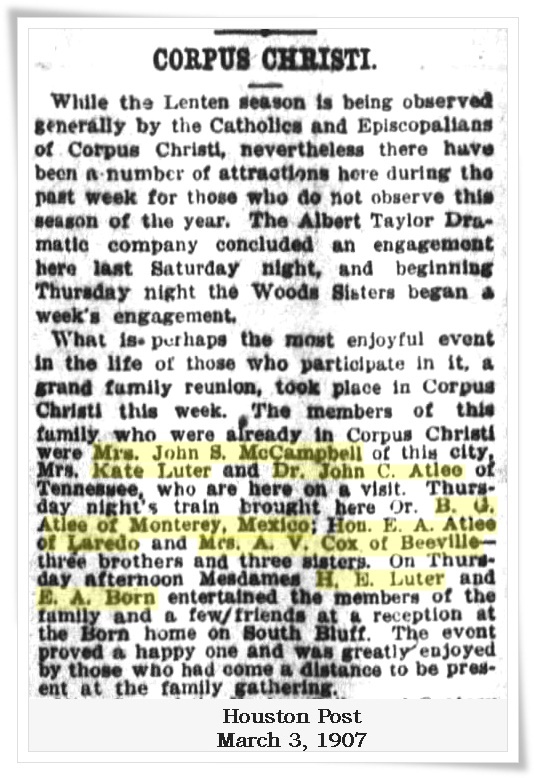 Edwin's fourth child, Sarah Catherine, in 1856 married Giles Exum Luter, district clerk in Goliad County. 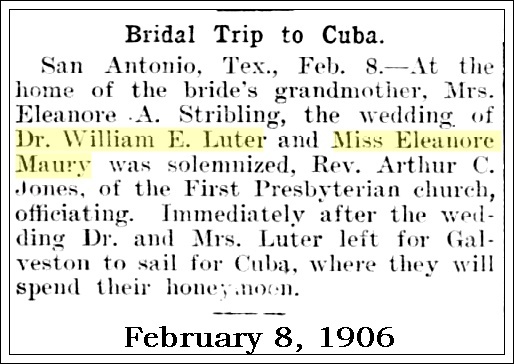 Catherine Atlee Luter had a son born in 1866, Dr. William Edwin Luter, who, in the late 1880s, had given his address simply as "Mexico". His brother, Henry Exum Luter, had a mail contract between Goliad and Cibolo in 1854, but later lived in Corpus Christi until his death in 1941. Before moving to San Antonio, Dr. W. E. Luter was a pharmacist and assistant manager of John Sealy Hospital in Galveston. The census of 1900 records him at 119 N. Alamo, in San Antonio, which was still used as his office in 1910. Today this is the old Post Office at E. Houston and N. Alamo. By 1902 he was president of the West Texas Medical Association which met in that city. He married Eleanor Stribling Maury in 1906, and became a member of the staff of the Santa Rosa Infirmary (Incarnate Word). He was also for a time physician and surgeon of the Mission Home and Training School for Girls in San Antonio. After their wedding, the Luters lived at 205 E. Pecan, at Navarro Street, next door to St. Mark's Episcopal Church on the north side of Travis Park Plaza. 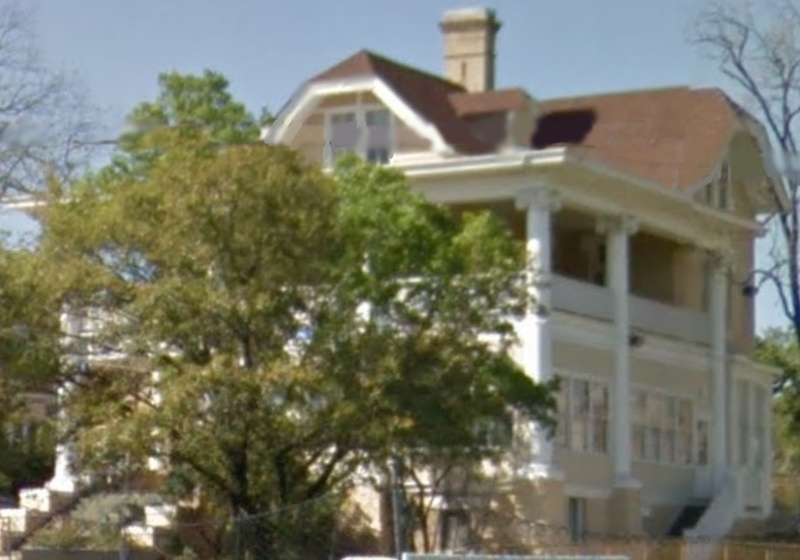 The lot on the south side of Travis Park (now 300 E. Travis Street) was in the process of being chosen as the site of the still standing St. Anthony Hotel, which was completed in 1909 by Brazilla Lafayette Naylor and his partner, A. H. Jones, Jr., the youngest child of a famous Texas hero, Augustus Harris Jones, and his third wife. 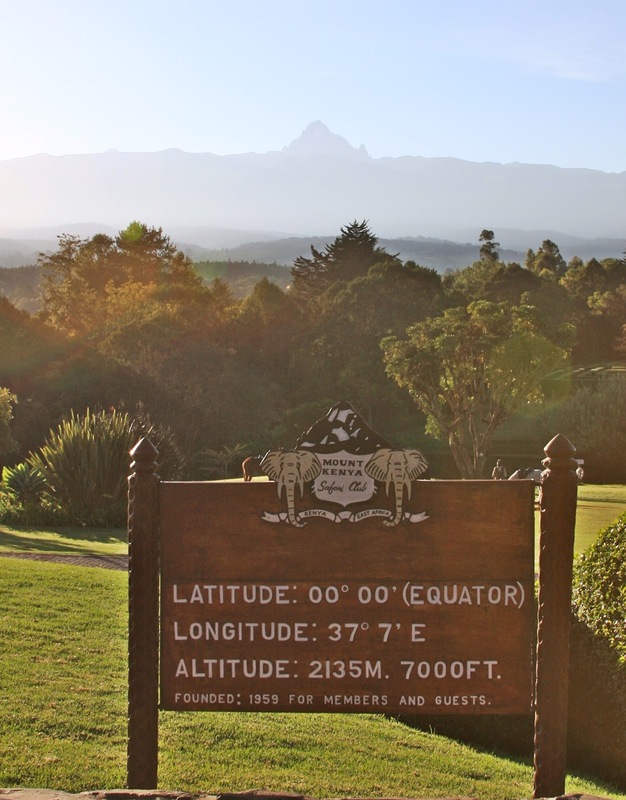 Naylor died in 1910, leaving his estate to his wife and daughter, Zilla, wife of Arthur Hunter Morton, who managed Naylor's properties for many years. Gus Jones was elected San Antonio's mayor in June 1912, only months before he died the following April, attended by Dr. Luter and another physician. Eleanor Maury's parents were Stephen Price and Eleanor Stribling (daughter of Benjamin Stribling) Maury. Her maternal grandmother, Mrs. Elizabeth Alexander Stribling, widow of Thomas Haile Stribling, had been born in 1836, the year Texas declared independence from Mexico. The 1900 census shows Mrs. E. A. Stribling living in a large residence at 117 E. French Place between N. Main and San Pedro in San Antonio, where she employed three live-in servants for herself, her son, Ben Stribling, and his nine-year-old daughter "Elinor." At some point the Luters began to live separately and were divorced. Dr. Luter died in 1930. In that same block with Eleanor's grandmother lived John L. Luter, a Texas-born man whose parents had arrived from Tennessee before 1861. His wife was Mabel Moody. In 1924 this house was sold to become an Episcopal girls' school called St. Mary's Hall, which in 1968 became the home of San Antonio Academy, a boys' school, previously affiliated with the elite West Texas Military Academy and Texas Military Institute. One alumnus of San Antonio Academy, coincidentally, was Robert Moss Ayres, the architect son of Atlee B. Ayres, who also did work on St. Mary's Hall when it was sold to his alma mater. Atlee B. Ayres' eldest sister was David Atlee Phillips' grandmother, Gussie Ayres Young, both of whom grew up in Houston and San Antonio as children of Nathan Tandy and Mary Parson Atlee Ayres, who had moved to Texas from Highland County, Ohio. Eleanor Maury Luter's paternal aunt, Ellen Maury, married James Luther Slayden, Congressman from San Antonio during 1897-1919. Ellen Slayden originated the Battle of Flowers, in 1891 "as an April 21 salute to the heroes of the battles of the Alamo and San Jacinto." 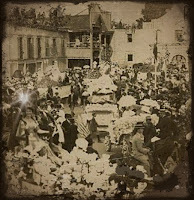 The parade quickly became a week-long fiesta which culminated with the crowning of a queen, and eventually a king as well. 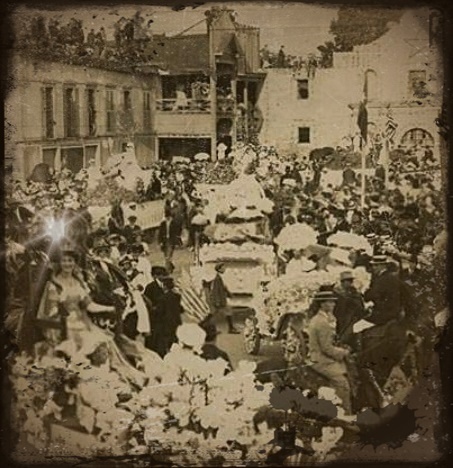 The Battle of Flowers Association was set up to plan the event as part of Fiesta San Antonio, and the city's women in society all worked together to make it a success. It remains as one of San Antonio's biggest traditions. The Maurys intermarried with the family of Texas hero Samuel Maverick, an 1825 Yale graduate and Virginia-trained attorney, who sought his fortune by moving to San Antonio in 1835. Ellen Maury Slayden kept diaries, which revealed how observant Mrs. Slayden had been during her husband's tenure within the Texas delegation in Washington, D. C. Much of her knowledge of Texas lore no doubt was passed to her sister, Jane L. Maury, who married Samuel Maverick and became the mother of F. Maury Maverick, another Texas Congressman. Cong. 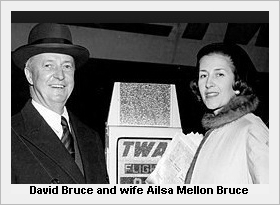 Maury Maverick's wife, Terrell Louise Dobbs, after his death in 1954, married Walter Prescott Webb, editor of the Slayden diaries. University of Texas professor Webb died in a one-car accident on March 8, 1963, at almost the same time the diaries were published. Webb's historic property, Friday Mountain Ranch, was sold that same month to Rodney Kidd, long-time Texas University Interscholastic League director, who turned it into a camp for boys, which would later (1983) be sued when a counselor allegedly sexually abused a young male camper. 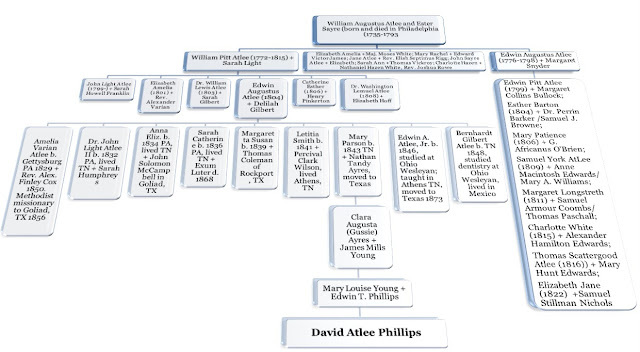 David Atlee Phillips was born and bred in Texas, but his great-grandmother, Mary Parson Atlee, born in Athens, Tennessee, was a direct descendant of William Augustus Atlee and Esther Sayre, the Pennsylvania-born progenitors of the Atlee clan. Named for Edwin's eldest sister, Elizabeth Amelia, who had married Episcopal minister Alexander Varian, Amelia Varian Atlee, was born in Gettysburg, Pennsylvania, in 1829 but lived in Athens, Tennessee, at the time she was married in 1850 to Rev. Alexander Findley Cox. Their eldest daughter, born in 1852 in Athens, was given the name of a popular poet, Felicia Hemans Cox. The Coxes' second child, Peery At Lee Cox, was born in Virginia in 1854, and a third child, born a year later in Tennessee, died at six weeks of age. Less than a year after the death of the baby, Rev. Cox was sent to do mission work in Texas, where a fourth child, Mary Eliza Cox, was born at Goliad, Texas in late summer of 1857--twelve years after the Republic of Texas had been annexed to the Union as a state. Felicia Cox grew up to marry in 1868 Youngs O. Coleman, one of the bosses at the Coleman ranches in Rockport, Texas, started by Margaretta Atlee's husband, Thomas M. Coleman and his father, Youngs Levi Coleman, who died in 1881. Their younger daughter Mary was married in 1881 to John H. Williamson in Lockhart, Texas, and a son, Alexander Bascom Cox, would be born in Goliad in 1861. 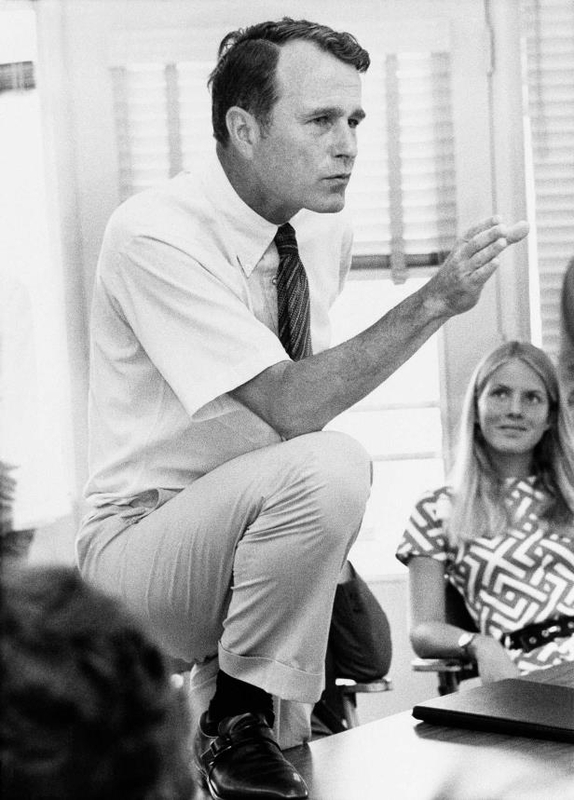 When he was 30, he married Martha Rischke, a German-born citizen of Texas. A widow since 1910, Martha and her daughter Amelia Katherine Cox had for many years lived in San Antonio only a mile or two from Bascom Cox's uncle, the architect Atlee B. Ayres. Katherine, single, was a schoolteacher supporting her mother when Atlee's first wife died in 1937. A few years later the cousins married. Martha died in 1952 at their home in San Antonio at 201 Belknap. Katherine's brother, A. Bascom Cox, Jr., became a Brownsville, Texas, attorney. Martha's sister, Anna, had married another cousin, Alex. O. Coleman, son of Youngs O. and Felicia Cox Coleman, and but she had died in 1909. Amelia V. Atlee Cox was the first of this branch of the Atlee family to arrive in Texas as early as 1855. Rev. Cox, a Virginian and a Methodist, arrived in Athens, Tennessee (home of East Tennessee Wesleyan College), and there he met Amelia, whose younger brother, Edwin Augustus Atlee, Jr. had recently attended Ohio Wesleyan University, not founded until 1844. In Ohio he met an Ohio native, Nathan Tandy Ayres, the man who would marry Mary Parson Atlee, Edwin, Jr. and Amelia's youngest sister. In Goliad the Coxes would meet John S. McCampbell, an attorney, who would marry another relative. Rev. A. F. Cox Passes Peacefully Over the River." According to this piece, Cox lived in that region of Texas around 40 years, "having reached Goliad December 1, 1856, and being a minister and most of the time actively engaged in preaching... He was born in Washington county, Va., December 1, 1823, was at the time of his death 73 years, 4 months and 4 days old. On May 1, 1850, he was married to Miss Amelia V. Atlee, who, with seven children survive him." It adds that Cox was a preacher for over 52 years, as well as having been for seven years "editor and publisher of a weekly paper in the town of Goliad, called the Goliad Messenger, which was finally changed to the Goliad Guard by the father of the present publisher (R. T. Davis). For about twenty-five years Bro. Cox has been a member of the West Texas conference." Washington Lemuel Atlee (1808-1878), who graduated from Jefferson in 1828 and practiced medicine at Lancaster, Pennsylvania until 1845 when he moved back to Philadelphia to teach at Jefferson's successor, Philadelphia Medical College. After graduating in 1853 from Jefferson College in Philadelphia, where his uncles had studied and taught, he returned to Athens, Tennessee to practice. There he married Sarah Humphreys. He could easily be confused with an uncle and cousin with the same name, who were also physicians, but who practiced in Pennsylvania. In May 1855, soon after his sister's husband was sent to Texas as a missionary, Dr. Atlee packed up his belongings and announced he too was moving to Goliad, Texas. The Athens newspaper bid him farewell and wished him well in his move to south Texas. Dr. Atlee, however, clearly did not find the wild west to his liking, as he had returned by August of the same year. In 1906 he and his wife celebrated their golden wedding anniversary in Chattanooga, Tennessee, where he died six years later. Anna Elizabeth Atlee, born 1834 in Gettysburg, grew up in Athens, Tennessee, but, in 1857, while visiting her elder sister Amelia Cox in Goliad, Texas, met a lawyer named John Solomon McCampbell. They married in Athens but made their home in Texas. In 1876 McCampbell formed a partnership with Anna's younger brother, E. A. Atlee, Jr., for three years before Atlee became a politician. McCampbell then entered into a second partnership with John S. Givens, which lasted until Givens' death in 1887. Givens' sister, it should be noted, was the widowed mother of Archer Parr, who grew up in Givens' home after his father's death. Edwin Atlee McCampbell, born in 1856, also practiced with his father in Corpus Christi following Givens' death. John McCampbell would also serve as a director with Richard King of the King Ranch on the railroad King and Uriah Lott were starting to build by 1876, which was sold in 1881 to a syndicate that chartered it as the Texas Mexican Railway to build westerly to Laredo on the border with Mexico. By 1890 the McCampbells were engaged with Uriah Lott in building a harbor in Corpus Christi, and by the end of the century they were in a law partnership with Robert Weldon Stayton, noted legal scholar. Sarah Catherine Atlee was born in Gettysburg, PA in 1836. In 1856 she married Giles Exum Luter, whose parents had moved west from North Carolina to Texas. 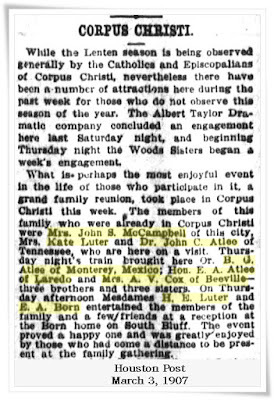 Luter died in Texas in 1868, and afterward Sarah took her three daughters (Emma, Sarah Margaretta and Clara Augusta Luter--all born in Goliad, Texas) back to her mother's home in Athens, Tennessee. They did, however, return to Texas from time to time, including in 1907 for a family reunion in Corpus Christi, hosted by the McCampbells. Born 1839, Margaretta, at the age of 20, married Thomas M. Coleman of Rockport, Texas. She died in 1872, leaving one son, Thomas Atlee Coleman. Born in 1841, Letitia married Percival Clark Wilson in 1856, a year after he graduated from Ohio Wesleyan University. He joined the university's faculty in 1861, but soon became an officer in the army as the civil war began. After the war, they moved to Athens, Tennessee, where he became a merchant, but he soon became involved in the organizing of the Athens Female College. Letitia's father, Edwin Atlee, helped in the founding of the college. However, the first President of the college bought additional lands with his own personal funds, which he then loaned to the college, on which he held a lien. It was Atlee who bid at the foreclosure sale to acquire the lands for the Methodist school in 1866. The next year the charter was granted, merging the female school into East Tennessee Wesleyan. It became coeducational in 1868. Mary Parson Atlee was the sixth daughter, born 1843 in Athens, Tennessee. 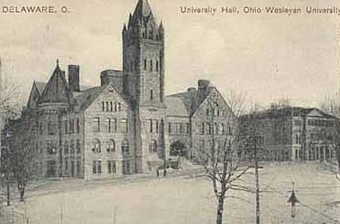 When her two youngest brothers were sent to Ohio Wesleyan College in 1865 for their education, they met a young man named Nathan Tandy Ayres, also a student at Ohio Wesleyan College in Delaware, Ohio, about 30 miles north of Columbus. According to an article that appeared in 1966 in the Hillsboro, Ohio, Press-Gazette, Nathan's father died when he was one week old, and his mother, having already lost two husbands to death, married William Plummer Bernard, a wealthy man of Hillsboro, Ohio, located east of Cincinnati. When the civil war began, Nathan joined the 89th Ohio Voluntary Infantry, which served three years during 1862-65. In December 1863 he was in Chattanooga, sending reports of the regiment's action back to his hometown newspaper in Ohio. He remained in Athens, Tennessee, to attend the Methodist college and in 1867 married Mary P. Atlee, whom he eventually brought back to his home in Ohio. In 1869-70, Tandy Ayres was recording secretary for the city of Hillsboro, Ohio, when he and an associate bought a glassware and china store. He sold his interest in the store to his partner in late 1873 and went into the dairy business, with 30 cows from whose milk he made his own cheese. In 1876 he made an exploration tour from St. Louis to south Texas on the Iron Mountain Railroad, writing a report, the first of several, for the local newspaper. He remained in Texas from February until late May that year, as he was said to suffer from asthma, which was relieved by the drier climate. This routine continued every winter until September 1879, when he packed the family up and moved to Houston. Clara Augusta "Gussie" Ayres in 1880. Edwin Augustus Atlee, Jr., born 1846, was a student at Ohio Wesleyan College in 1866, when he met Nathan Tandy Ayres. In 1872 Edwin taught Latin and literature East Tennessee, before he relocated to Texas and became state senator from 1885-1901 for a district including Duval, Webb, Nueces, Cameron, Hidalgo and other counties bordering Mexico. This is the same district which would later be controlled by Archer "Archie" Parr, who began his career working for the Coleman-Fulton Pasture Co., owned by Thomas Coleman, Edwin Jr.'s brother-in-law. Around 1907 Archie, assisted by his uncle, John Givens, law partner of another of Edwin's brothers-in-law, began a political career Duval County. By 1915 he was noted for election fraud, political corrupution and manipulation of the court system, protecting Democratic politicians. His son George Parr succeeded Archie and became known as the Duke of Duval. The Parr political machine was mentioned in a piece I wrote in 2000, relating to its role in stealing an election for Lyndon Johnson. Named for his maternal grandfather, Bernhardt, the youngest of the siblings, was born in 1848 and attended preparatory school in 1866 at Ohio Wesleyan, along with his slightly older brother, and later studied dentistry there. 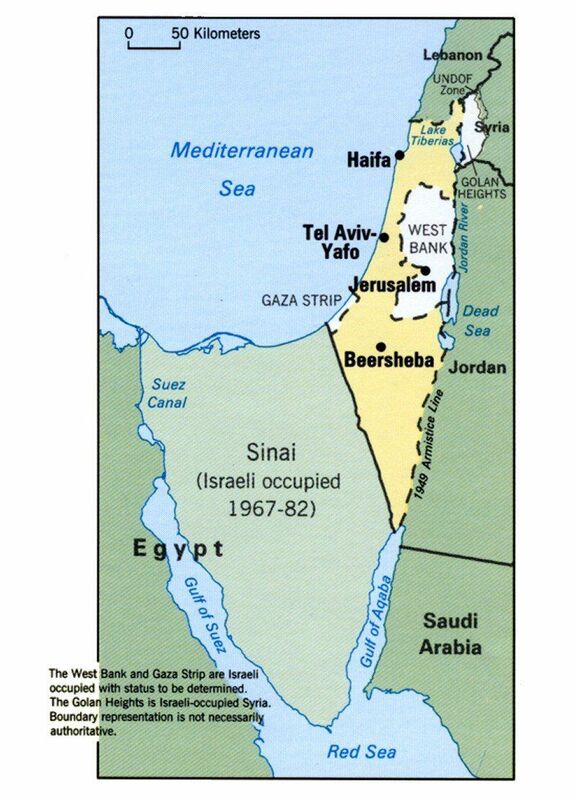 "It matters not one iota what political party is in power or what President holds the reins of office. We are not politicians or public thinkers; we are the rich; we own America; we got it, God knows how, but we intend to keep it if we can by throwing all the tremendous weight of our support, our influence, our money, our political connections, our purchased Senators, our hungry Congressmen, our public-speaking demagogues into the scale against any legislature, any political platform, any presidential campaign that threatens the integrity of our estate." 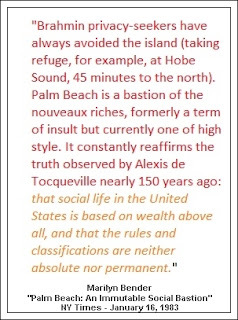 Frederick Townsend Martin, The Passing of the Idle Rich (1911), p. 149. Solomon Robert Dresser had a creative, inventive mind, and he was a hard worker, to boot. When he encountered a problem in his business, he set out create a solution. As a result, he became the owner of numerous patents he either designed himself, or paid others to design, for pipe coupling devices which prevented natural gas from leaking from the joined sections of pipelines. 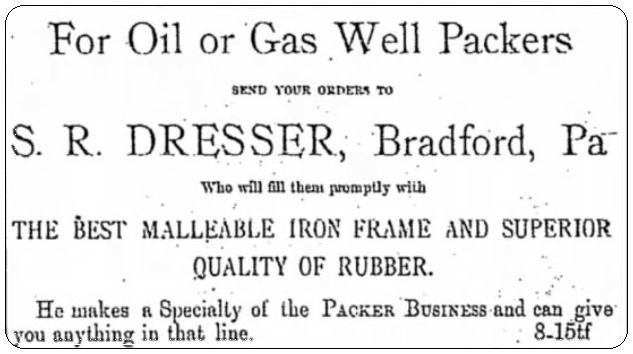 The Dresser company really took off in 1878, when Solomon located his family in Bradford, Pennsylvania, in the state's northwest corner. While he worked, his wife (formerly Vesta Simpson) had given birth to children, only two of whom lived to adulthood--Ione (1870) and Robert Alexis (1877) Dresser. Vesta died of tuberculosis in 1883, but Solomon remarried two years later, and the new wife (Caroline Kirsch) gave him two more sons--Carl Kirsch and S. Richard Dresser. In 1906, after Solomon had served two terms in Congress, it was reported that he had decided to build a large factory in Bradford, Pennsylvania to mass-produce his most common coupling devices. Having worked too hard, it was said, he became ill around 1907 and died after four years of illness. Robert Dresser married Olive Brady in 1900 and later worked for the Boy Scouts of America organization in Bradford, having little interest in his father's passion. 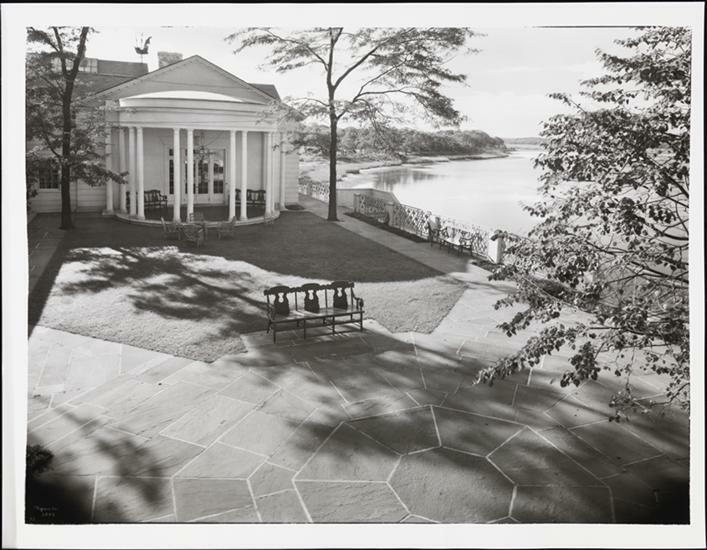 Solomon Dresser's mansion in Bradford sat atop a rise--at 149 Jackson Avenue--and was not far from his Boylston Avenue office, where the Medical Plaza in Bradford sits today. The factory was situated across town. 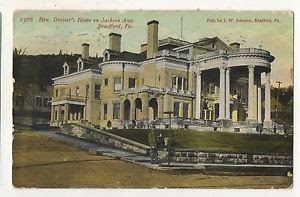 Caroline, Carl and Richard had lived in the gigantic residence, but by 1911, when Solomon died, Carl Dresser was away at Princeton while Richard was in Pottstown, Pennsylvania, at the Hill School. Carl graduated from Princeton in 1912 and was followed there by Richard two years later. When Caroline died in November 1916, she was stopping in New York City, with plans of visiting Richard in Trenton to take in Princeton's football game against Yale. Five months earlier, Carl had taken his mother and Richard, by then a junior at Princeton, to Atlantic City, New Jersey. He was accompanied by his new lady friend, Pauline Steese, divorced since March of that year. The mansion would remain a relic of Bradford history for many years thereafter. Richard would bring his family there to live, and after his death his widow, who died in 1956, bequeathed it to the Presbyterian church, which made it into a home for the aged. Ione Dresser's husband, Fred A. Miller, worked for the Dresser company all his life, even after the company was sold to W.A. Harriman & Co.
Pauline's father was Charles Ransom Vandervoort of Jamestown, New York, who left his family home at Tonawanda, New York, in 1882 to work in Jamestown, New York, at a large textile mill called Broadhead Worsted Mills. In 1907 Pauline's brother, Sherman B. Vandervoort, went into business for himself manufacturing cement blocks, which he later expanded into coal delivery, taking his father into the company. Sherman's wife was the daughter of a Bradford, Pennsylvania, physician and maintained contacts by joining a Bradford social club through which they knew the Dresser family. 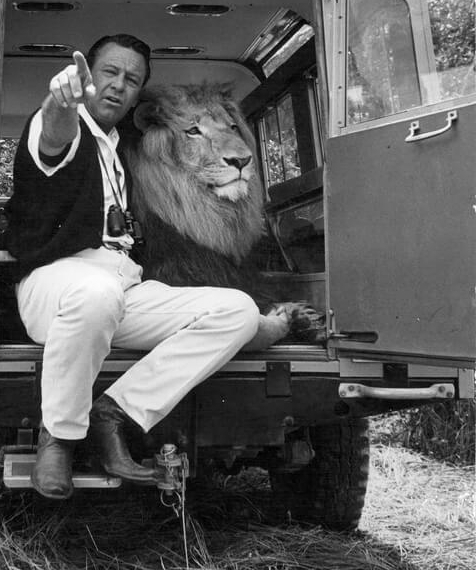 Carl, like Sherman, was an avid sportsman. Pauline's first marriage in 1908 was to Charles J. Steese, Jr., assistant cashier at First National Bank of Massillon, Ohio, where his father was the bank president. Pauline had divorced him in the spring of 1916, a few months before she accompanied Caroline and Carl Dresser to Atlantic City the following June. Pauline's marriage to Carl Dresser was announced in the "summer resort" section of the Pittsburgh Press on August 13, 1916. Although Carl was secretary of the S.R. 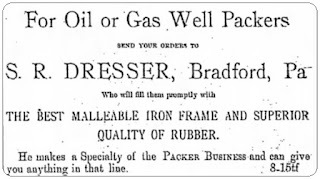 Dresser Manufacturing Co., his main focus was finding new supplies of oil and gas, through his own company, Dresser Gas Company, which had drilled for natural gas in 1896, built a pipeline to distribute its gas to customers in northeastern Ohio. He first met Pauline, while she was playing society wife to her banker husband of Massillon, Ohio. By the time Carl and Pauline married in 1916, however, he was president of the Malta & McConnellsville Gas Co. in Malta, Ohio, having succeeded to the company after his father's death in 1911 and his own graduation from Princeton. Steese's parental rights were terminated, apparently with his consent, and both of Pauline's sons, Charles and Bradley Steese, were adopted by Carl. The family moved into the mansion with Carl's mother until Caroline's death that November. T. N. "Thede" Barnsdall, who had worked in Bradford before following the oil discoveries in Oklahoma, proposed Carl for membership in the American Institute of Mining and Metallurgical Engineers. His father had started Thede as an oilman in Bradford, Carl Dresser's hometown, and he eventually acquired over a million acres of oil lands in the Osage Indian reservation in Oklahoma upon his death in 1917. 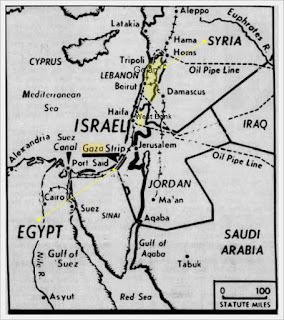 Those acres were found to actually end up in control of Standard Oil of New Jersey, which had given Barnsdall a loan of several million dollars, according to an investigation made by the U. S. Senate in 1917. 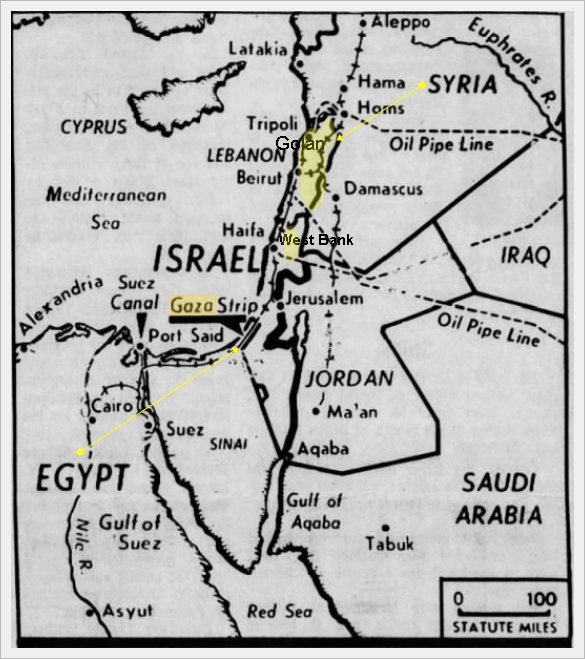 Newspapers had been reporting that fact since 1908. By 1918 Carl Dresser was talking of moving to Tulsa, Oklahoma, where he hoped to expand his oil and gas business. He acquired a residence in Tulsa, where Pauline is said to have set up a "salon" to entertain other wives of wealthy oilmen in that location. At the Tulsa County Club in June 1922 Carl and Pauline Dresser hosted a tea dance in honor of the wedding of Charles B. Wrightsman to his bride, Irene Dill Stafford of Wilkes-Barre, Pennsylvania. 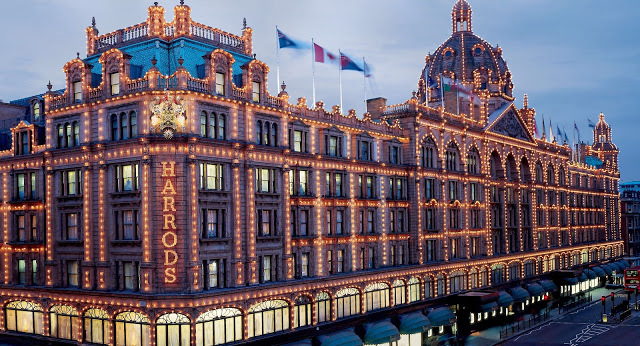 Irene was born into a Catholic working class family, the daughter of Thomas A. Stafford who in 1925 managed a clothing store and lived in a rented residence. Irene's mother died before 1940, her father had remarried, and at age 70 was still selling retail clothing and still living in rented accommodations at 96 S. Main Street. It was sometimes claimed that Irene Wrightsman had been a debutante who had wintered in Miami Beach, Florida, but the truth was much different. 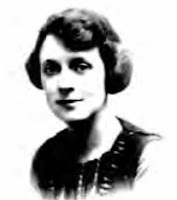 She had first gone to Florida because her sister Kathryn, who married Thomas McHale in 1918, was there with her husband. 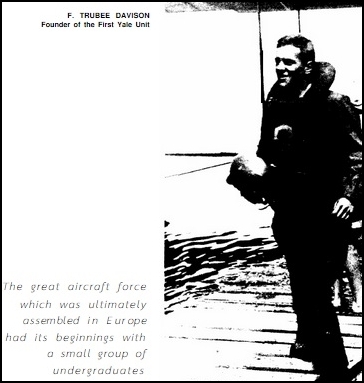 Thomas enlisted in the Navy aviation division when the United States entered WWI. Kathryn, a dance teacher in Pennsylvania, worked as a "dancing hostess" at the Casino St. John in Miami Beach while her husband was stationed at the Miami Naval Air Station. J.N. Lummus, who owned the property on the southern portion of the beach, called the land Ocean Beach. 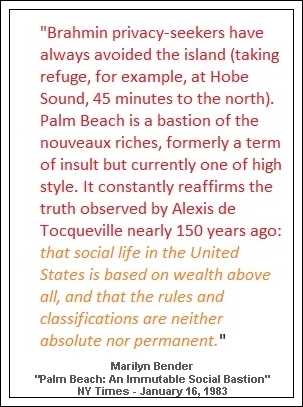 Carl Fisher called his properties Alton Beach, and Collins used Miami Beach as a name. 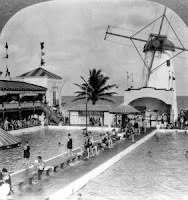 Fisher bought the facility from Collins in 1917 and, according to “Billion Dollar Sandbar," Polly Redford's 1970 biography of Miami Beach, added "$350,000 worth of improvements to the bathing pavilion that the Collins family had built of driftwood three years earlier. With a second pool and a Dutch windmill to pump in seawater, a restaurant, ballroom, and shopping arcade topped with rococo towers, the old Collins pavilion was transformed into the "Roman pools." 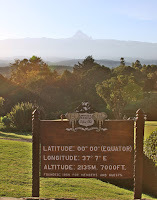 From that point on, the place took on a more social air. It was fashionable to be seen at the Roman Pools and Casino. Leading swimmers appeared there regularly, and visitors dined in an elaborate setting or danced the night away in the main ballroom. By 1925, the casino and pools had moved into the hands of N.B.T. 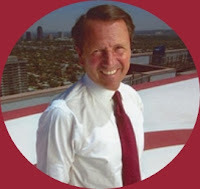 Roney, who was about to build a magnificent hotel on the northern side of the pools-- calling it the Roney Plaza. Starting in 1922, Bessemer Properties, a real estate venture controlled by the family of Henry Phipps, Jr. (co-founder with Andrew Carnegie of the company that became U.S. Steel) began to accumulate parcels of land on both sides of the intracoastal canal for future development. 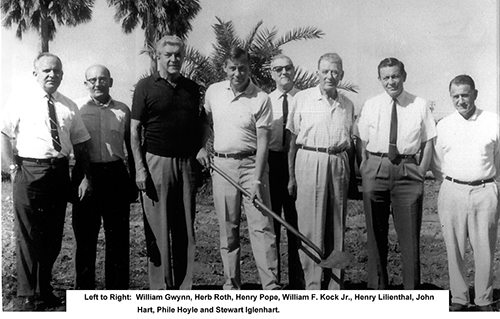 Friends and business associates of the Phipps family in Palm Beach saw the roughly 500 virgin acres of property as an ideal location for a golf course and polo fields, surrounded by seasonal residences. Charles B. 's father, C. J. Wrightsman, had been born in Ohio but got into the oil business in Pawnee, Oklahoma, before his son was born there in 1895. C.J. was a lawyer, leasing lands of members of the Osage Indian Reservation tribe. At first his family lived in the tiny community south of a bend of the Arkansas River, on the west side of the Indian lands, but by 1910 had moved to Tulsa. Somewhat more prosperous, C.J. add two live-in yardmen to a household that also included a Swedish house maid. Tulsa was fifty miles away, now on the southeast side of the Osage Reservation, north of another bend of the Arkansas River. 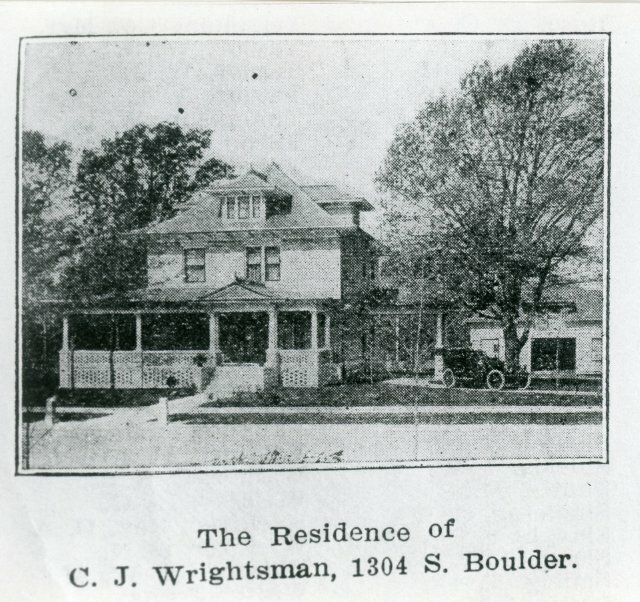 Today the United Way building sits where their home on Boulder once stood. There were no tall buildings in 1910, such as the Boulder Towers which Skelly oil built in 1959 across from where their house sat. Early in his career, Sinclair attracted the attention of wealthy speculators like Chicago meatpacker J.M. Cudahy, Pittsburgh capitalist Theodore Barnsdall and James F. O’Neill, president of Prairie Oil Company, a subsidiary of John D. Rockefeller’s Standard Oil of Kansas. 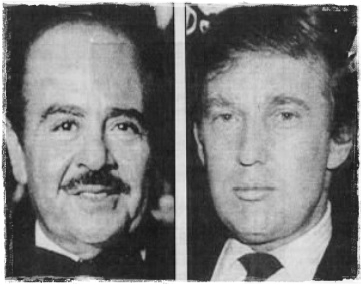 Unlike his backers, Sinclair came from humble beginnings. C.J. 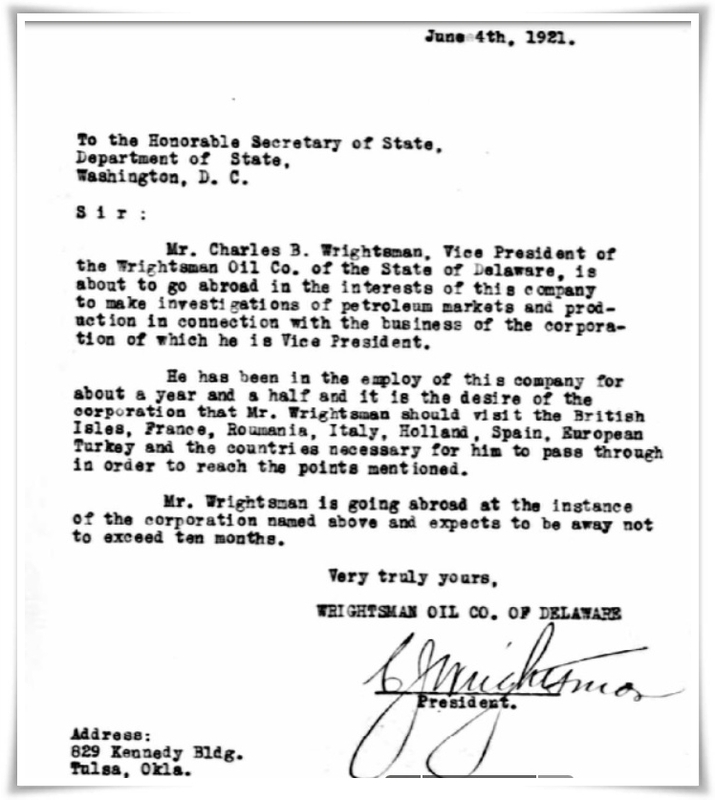 's only son, Charles B. Wrightsman, was away at school during this time--first at Phillips Exeter prep (class of 1914) then pre-law at Stanford University in California, where he was a member of Delta Kappa Epsilon (ΔKE) during 1915. From there he went on to Columbia University in New York, where he became interested in becoming a pilot in 1917, as America began revving up to enter WWI. As a resident member of the Aero Club of America, at Madison Avenue at 41st Street in Manhattan, C.B. served on the Central Committee which funded the Liberty Loan. 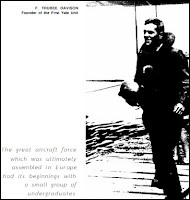 He was also an ensign in the Naval Militia of New York, and thus came into contact with men from the East Coast and Ivy League schools involved in the Aerial Coast Patrol. F. Trubee Davison, Henry P. Davison and Robert A. Lovett were three of the twelve who constituted the "First Yale Unit." After training all summer at Peacock Point and Port Washington on Long Island, they returned to New Haven in the fall and organized the Yale Aero Club. As cold weather approached, Lewis Rodman Wanamaker, son of John Wanamaker and brother of the late Thomas B. Wanamaker, allowed them to use the property at West Palm Beach, where he was building a new flying boat, and airplanes were also supplied by Henry Woodhouse through the Aero Club of America. As more airplanes were donated, the size of the group increased. William A. Rockefeller and Samuel Sloan Walker were among the 18 new recruits in early 1917, and the pilots of Unit #1 were sworn into the Naval Reserve Flying Corps on March 24, 1917. The unit which trained C. B. Wrightsman, Columbia's Aerial Coast Patrol #4, was engaged in a balloon training camp with St. Louis millionaire Albert Bond Lambert--the St. Louis Lambert family profiled in Part IV of our series here on George Bush 41's grandfather Bert Walker. There were other ACP units as well, including one in Dayton, Ohio, of which Harold E. Talbott, Jr., whose father was president of the Dayton-Wright company, was part. 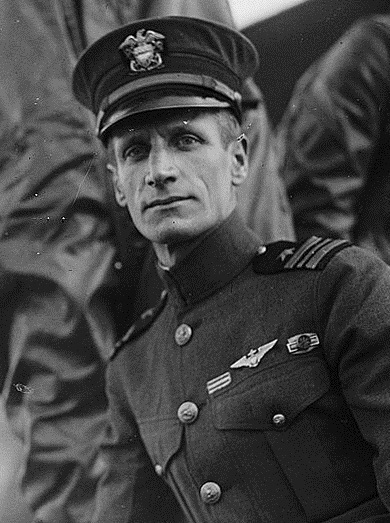 After his Naval Aviation service during the war, C.B. went abroad to Roumania and Russia, to "make investigations of petroleum markets and production" for his father's company. We must assume he also reported back to the appropriate government officials at the time. President Woodrow Wilson had been re-elected in 1916, and his head of the War Council of the Red Cross, banker Henry P. Davison, was father of two of the young men who instigated the group of college men with which C.B. trained. F. Trubee Davison in 1951 would be named director of personnel for the newly established Central Intelligence Agency, leaving us to wonder if he had not been involved in the agency from its first days. Intriguingly, Wrightsman claimed that he first saw polo played in 1921 at the Westchester Cup. 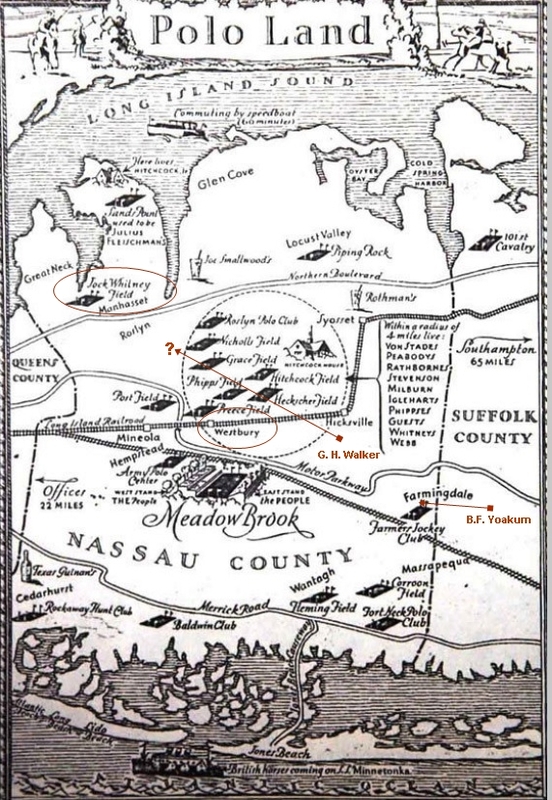 That event took place at Meadow Brook, the polo fields closest to Bert Walker's Long Island residence, and all the players lived nearby. 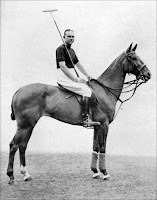 More than a decade after watching his first polo match, Wrightsman was still an avid polo enthusiast, frequenting clubs such as Gulf Stream in Florida, developed by, among others, the Phipps brothers and Stewart Ighlehart, close neighbors of George Herbert (Bert) Walker in Old Westbury, Long Island. 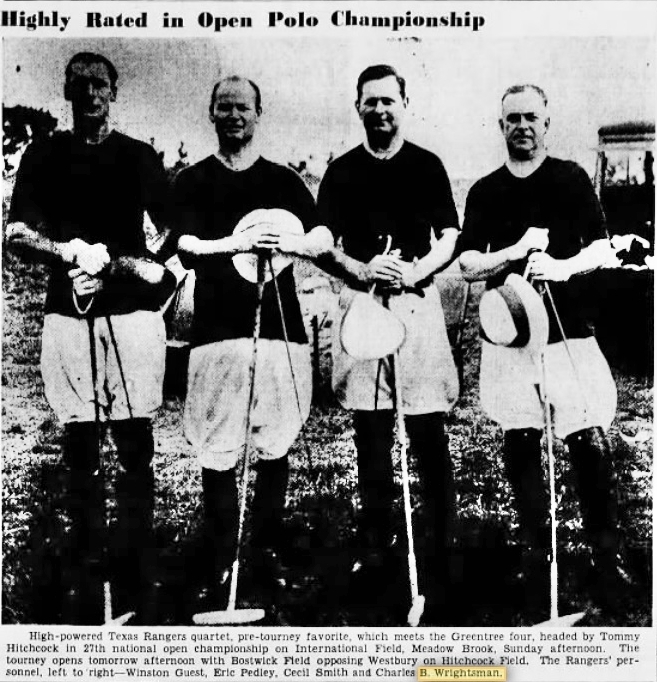 The Wrightsmans in 1935 gave their address as Wheatley Hills in Old Westbury, the same address used, not only by the Walker family, but also by Cornelius Vanderbilt "Sonny" Whitney, frequent polo teammate of Tommy Hitchcock, Jr. In 1939 Wrightsman would still be playing with his team known as the Texas Rangers, against Hitchcock's team. 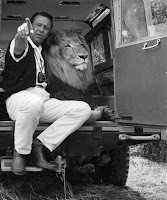 Sonny Whitney was not only an heir to his mother's Vanderbilt fortune, he was also a pilot who ran an airline company, and he was heir to a fortune from his father, Harry Payne Whitney, from whom Bert Walker and Averell Harriman acquired the first horses with which they set up a partnership known as Log Cabin Stud based in Wheatley Hills, Old Westbury. The Phipps land in Florida was purchased by Henry Phipps in 1912, when he paid $90,000 for one-thousand feet of vacant oceanfront land located on Palm Beach’s North End, but the family eventually amassed 25 miles of ocean-front property, and they "financed the Miami International Airport, the Venetian Causeway and the University of Miami, as well as developed the Miami Shores and Bay Point subdivisions. 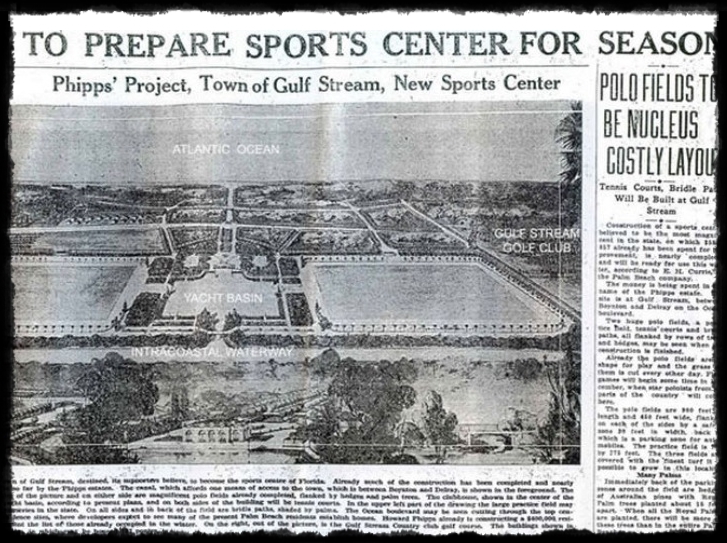 Their portfolio included the two miles of oceanfront that became the Town of Gulf Stream." In 1923 they built the Gulf Stream Golf Club. 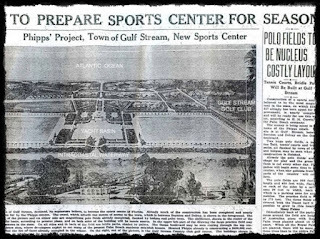 Before that, however, they had constructed the polo grounds next to the Everglades Club. Within this circle of millionaire sportsman, George Herbert Walker had insinuated himself. 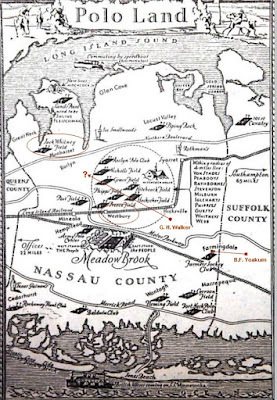 We do not know the exact location of the residence he acquired in the early 1920 at Wheatley Hills, Old Westbury, but we do know it was surrounded by polo fields and golf courses, not to mention fellow horse breeders. The sale to W.A. Harriman & Co. 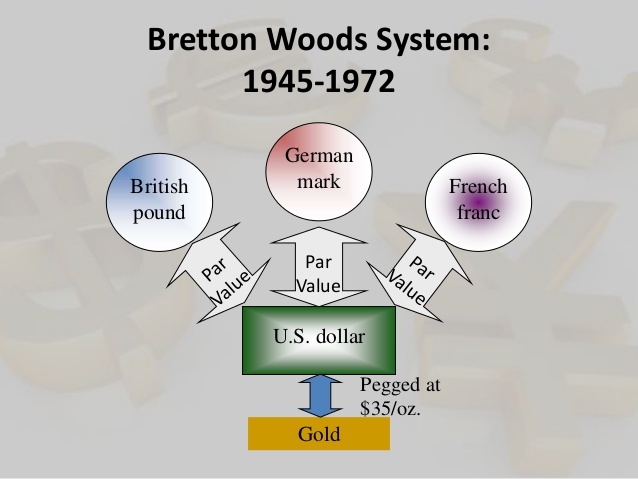 They were married in 1916, he being 25 years old, the son of wealthy parents, and worth over $1,000,000, among his assets being some Dresser Manufacturing Company stock upon which this litigation principally turns. That was a close corporation, and the stock was held in the family. She was 26 years of age, but in both marital and financial experience was much older than he, having been married and divorced, then facing the world with one child six years, and one three years, of age, with a total financial worth, according to her own testimony, of about $15,000, principally the proceeds, over attorney's fees, of $23,000 alimony. He owned a gas company and a torpedo company, but later sold them. 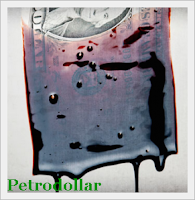 About two years after marriage they moved to Tulsa, Okla., and he was reported in 1919 and 1920 as worth $2,000,000, largely speculative, paper value of oil leases, although he did have considerable production. 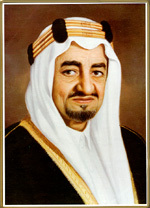 In 1919 and 1920 and subsequently he spent about $750,000 in drilling many dry wildcat wells, but much of that was paid from production, of which he once had considerable, and much was met from the proceeds of the sale of leases around the drilling sites. That did not put him on the verge of bankruptcy and in the terribly embarrassing condition existing at the time of the divorce. That condition was due to expenditures for living expenses, which ran about $100,000 a year, and which she refused to appreciably reduce. His stock in the Dresser Manufacturing Company in 1925 and 1926 paid about $60,000 in dividends each year, and in 1927 about $70,000. The Harriman deal came about because Mr. Atkins [bookkeeper for S. R. Dresser Manufacturing Co., called as a witness by Pauline] knew Mr. [Alexander O.] Cushny of that concern and sold him the idea of getting control. 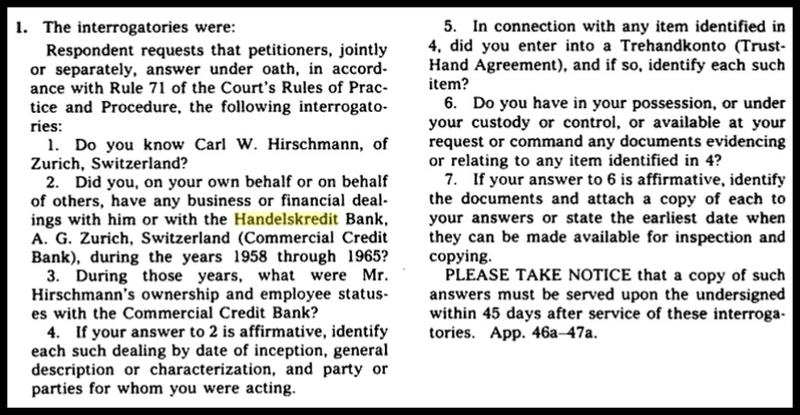 Carl Dresser was in debt and had to have money, and at first W. A. Harriman & Co. loaned him $225,000, out of which Mr. Atkins got a commission of $15,000. Later he borrowed $15,000. 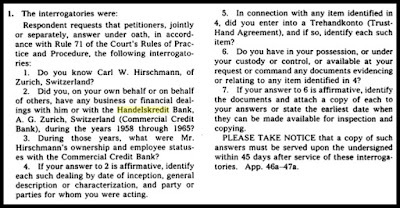 And in closing up the deal they paid $17,000 on his debts, paid $30,000 to his [Carl's] second wife [Gloria Jack], whom he married December 13, 1927, about eight months after the divorce, and issued the balance, $555,000 of paper price to her in class A stock, 12,000 shares at $46.25 each. 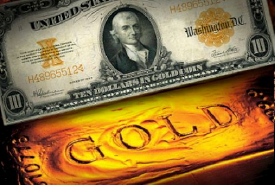 Also, in the original agreement they agreed to loan him up to $400 a share on up to 500 more shares, evidently to permit him to try to get the stock from his brother [Richard], in which he was unsuccessful. Also, they took an option on the 1,000 shares at $650 a share, but nothing indicates that they would have exercised it if the deal had not gone through. Nobody got $850, that price to Carl Dresser being largely a paper price, and the others got only a paper price of $700 share, plus about $38 tax, which would be a paper price of $738,000 for 1,000 shares, which was the number owned by Carl Dresser, if the owner paid the tax from his own money. If we were to adopt either price as a basis to work from, the price to the others would be the better basis, for they did not have to sell, and none of that was for aiding in putting over the deal. The other stockholders took new stock for about all of the price, and it seems that had they not done so, the deal would not have been made, for W. A. Harriman & Co. put as little money in as it had to, and busied itself in getting it out with despatch. The above details of this opinion were not made public until April 1933, two years after Carl's death from "liver trouble," and five years after his remarriage in 1927 to Gloria Jack of Kane, Pennsylvania. We know, however, from Darwin Payne's book that what followed next was putting Neil Mallon in place as Dresser's president. 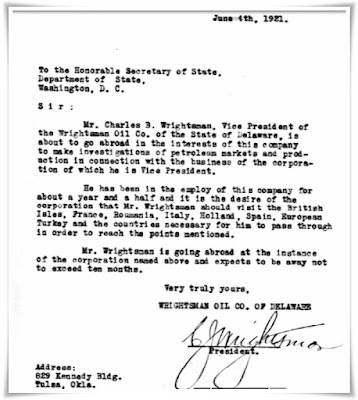 In 1931, instead of selling or dividing the Dresser company, the stock was shifted to the new Brown Brothers Harriman company, of which Prescott Bush became a partner. Bert Walker remained at the old offices (39 Broadway) while Prescott moved to the new digs--Brown Brothers offices at 59 Wall Street. Four months after losing her appeal against division of the Dresser assets, Pauline made headlines once again: "Pauline Dresser To Wed Col. Rogers". The friendships she had made in Tulsa in 1922 paying dividends by 1933. Pauline was honored by an engagement dinner given by her stepdaughter-to-be, Millicent, daughter of Col. Henry Huddleston Rogers. 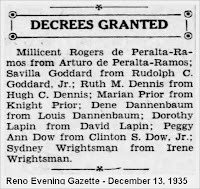 Millicent was then married to an Argentine millionaire named Arturo Peralta Ramos. It is not rightly known exactly how Pauline snared her wealthy third husband. Their wedding took place at Col. Rogers' "summer home" on Long Island. Fortunately for her, Pauline did manage to stay married to her multi-millionaire husband, becoming a widow after only a two-year marriage. The mansion Pauline inherited in Southampton, Long Island, New York, had also been the scene of Millicent's 1927 wedding to the Argentinian polo player. 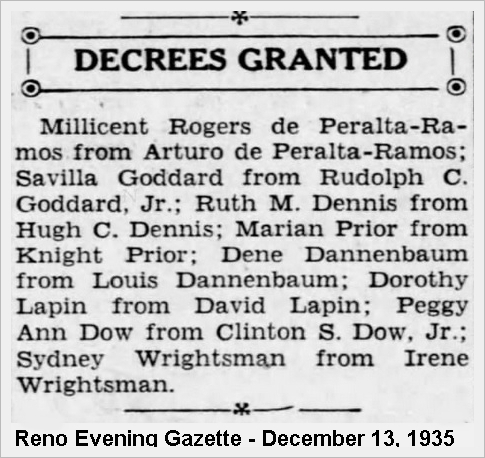 Intriguingly, Millicent divorced him in December 1935 after a six-week stay in Reno, obtaining her divorce on the same day that "Sidney" Wrightsman obtained a divorce from Irene Wrightsman--the same person Pauline had honored with a tea on the eve of her wedding in Tulsa in 1922. Possibly one of those amazing coincidences? No mention of the Charles B. Wrightsman divorce has been found, although we know he did marry Jayne Larkin in 1944. His obituary failed to mention his first marriage, which had occurred at the time the Dressers had known them in Tulsa in 1922 and produced two daughters, Irene Margaret and Charlene. The daughters were living with their divorced mother in a modest apartment building in Santa Monica in 1940, a mile from the Pacific Coast highway. Five years earlier they had all lived at the Warwick Hotel in Houston, and C.B. had his office for Standard Oil of Kansas at #1540 Mellie Esperson Building. In May 1937, Walter Hoving, after leaving Chicago and obtaining new employment as president of Lord & Taylor in New York, married Pauline at her New York City apartment on 57th Street, and they immediately sailed to Bermuda, along with her son (Bradley Steese Dresser) and his new wife--a sort of double honeymoon. a lavish estate in Southampton on Long Island, ... set on 1400 acres of prime land, including an 800-acre shooting preserve called The Cow Neck and a 400-acre lake, called Scallop Pond. As designed by the renowned architect John Russell Pope, the Rodgers’ manor house resembled not one, but several modest Colonial cottages, all strung together, to form an abode of palatial proportions with opulent appointments, not so different from Marie Antoinette’s retreat at Versailles. It included perhaps the most lavish Greco-Roman indoor swimming pool ever conceived in this country, which has since been destroyed. Pauline would later be described by stepson, Thomas Hoving, in his 1994 book--Making the Mummies Dance: Inside The Metropolitan Museum Of Art--as a woman for whom he "developed an instant hatred" (page 85). Tom's parents were divorced when he was five, in August 1936, only seven months before Pauline married his father, and he recalled spending summers with two governesses at Pauline's Long Island estate as his stepmother tried to teach him how to live "in society." 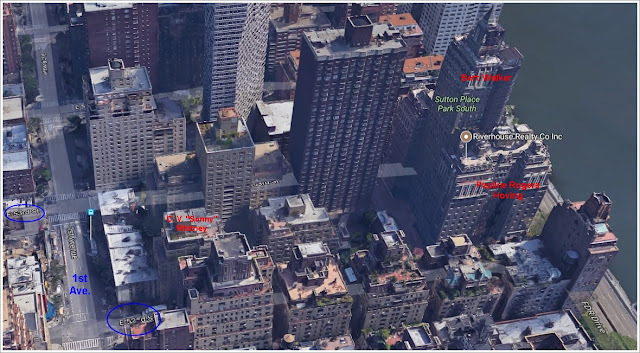 During cooler months when he lived as a boy in Manhattan, Tom would go to the Hovings' apartment on the top floor of River House, 435 East 52nd Street on the East River. Sonny Whitney had a residence one building down at the corner of First Avenue, and Bert Walker's Manhattan residence was a few doors away at One Sutton Place South. Tom would even hint in his book about a possible romance between his stepmother Pauline and Charlie Wrightsman. 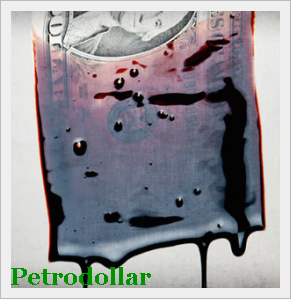 The Exxon story, too, is also hinted at here, but further research articles will hopefully bring it into clearer focus. Frederick Townsend Martin wrote the book from which the quote is taken about three years before his death. When his brother's obituary appeared in the Washington Post (1913), Frederick was said to be "a Bowery settlement worker." The real "idle" wealth of Frederick's brother came in the form of his wife's inheritance of hundreds of millions from her parents, with which she became noted for exceptionally elaborate balls at the Waldorf-Astoria. In Atlantic City, Pauline apparently encountered her ex-husband with an actress using the name Mae Francis, (a niece of "Wild Bill" Donovan, a famous baseball player of the day, not the spy). Steese, in his roadster, was insanely racing against aviator E. Kenneth Jaquith, flying above him. Steese married the actress early in 1917. The next time he was heard from, however, he was married to a woman named Blanche, with whom in 1925 he had built a house at Lake Salubria near Bath, New York, and moved there from Ohio. When Steese's mother died in 1929, Blanche was named Executrix. Soon after that, he received another inheritance from Anna Steese Baldwin, his late father's sister. He had no problem inheriting from family, but he suffered no qualms it seems in disinheriting his own two sons, giving them up to be raised by Pauline's second husband.